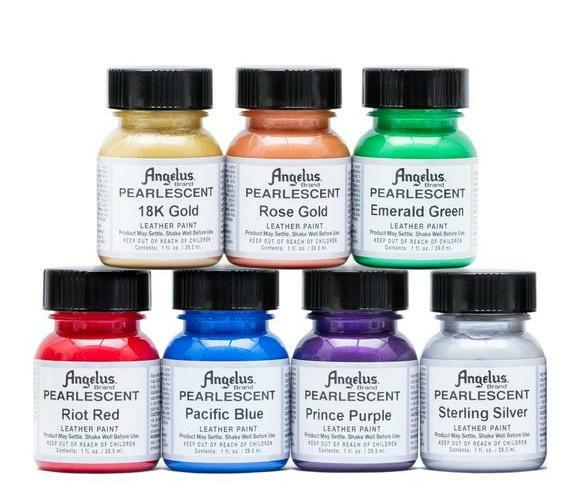 "Angelus Pearlescent Acrylic Paint Angelus Pearlescent Leather Paint"
Angelus Pearlescent acrylic paints are iridescent paints that produce a brilliant shine that shifts and changes in the light. If you want your customise projects to shine, try these iridescent paints. Create a pearl effect on your customise sneakers. 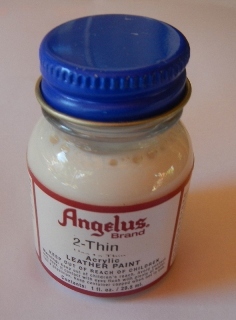 AngelusPearlescent Leather Paints are iridescent paints that create the pearl effect on your custom sneaker projects. Angelus Pearlescent Paint collection comes in 7 vibrant colours. They produced brilliant shine that shifts and changes in the light. Uses are: To paint sneakers to make it into custom sneakers the way they like. Apply the Pearlescent paints with a paint bursh or sponge pad. Allow to dry between coats. For best results make sure article is clean before application. Some leather articles have a silicon factory finish. It may be necessary to clean the item with Angelus Preparer and Deglaser. Silicon treated articles may cause acrylic paints not to adhere correctly. Allow to dry completely before wearing. For higher gloss and scuff protection, aplly a coat of Angelus Acrylic finisher or Angelus Neutral Leather Paint after paint is dry.